← Kingston Writer Festival: Where will you be? After a lovely weekend in Kingston at the Kingston Writer’s Fest I am back in the city and here to update you on all the fun you might have missed. But fear not, Quill friends, if you weren’t able to make it out this year the Kingston Writer’s Fest happens every year and there will always be more events to attend. The Holiday Inn was set up with ticket tables manned by volunteers dressed in all black, coffee stations with china cups and saucers, and a makeshift bookstore carrying all the books featured at the festival. The first event I attended, and the one that will be of most interest here, was “Daughters of the Revolution” featuring Merrily Weisbord and our very own Laurie Lewis. I met up with past Porcupette Monique and we went in together to find our seats. Laurie and Merrily share similar experiences growing up with Communist parents and their discussion revolved around their experiences. Merrily asked Laurie questions, augmenting Laurie’s answers on occasion with her own comments. The discussion began with Merrily asking Laurie what had sparked her to write Little Comrades and what the book was about. Laurie responded by comically describing the home she bought in Kingston upon her retirement for herself, her mother and her husband. Both Laurie’s mother and husband were writers and they did not get along. Laurie laughingly called her home the house of scribbling old geezers, adding on a more series note that she began to write Little Comrades because, in that house, she had to write to feel like she existed. Laurie described writing the memoir, discussing memory and memory as story. Little Comrades deals with a brief time in Laurie’s life, that of childhood and young adulthood. She said that when she looked back to find a memory, the process of remembering it would make the memory blossom and grow until there was much more there than she had originally thought. Though she did claim that this process is not without flaws. She admitted that no memory is perfect and it is possible that through remembering an event it may become changed. She conceded that it is possible that while she remembered a dress as blue—it might have actually been another colour all together. Laurie evoked the world of her childhood for the audience, describing to Merrily the fear in which she had lived. She aptly said that as a child you don’t know that you live in a separate world; you don’t know that there are other families that do things differently. She told us of the unspoken rules in the house: you did not speak about what happened in the house, you did not speak about who came to visit the house, you did not talk about who came to stay for a few days. Laurie relived one particular moment which elucidated the fear in which she grew up. It was from the period when her parents went into hiding. She had been outside playing with her brother when two RCMP officers came over and began to question them. 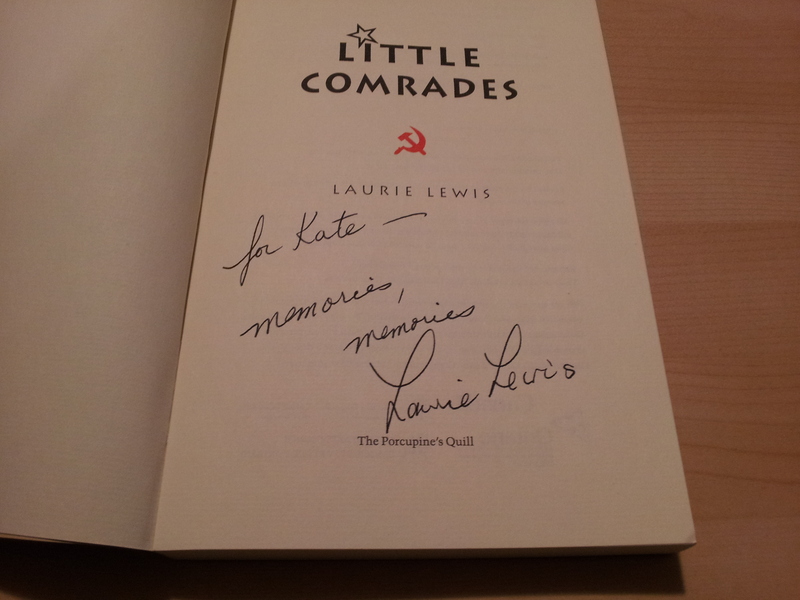 Toward the end of the discussion, Merrily asked Laurie about the process of writing Little Comrades and whether the experience had been liberating for her. At this Laurie paused. She said that writing Little Comrades had liberated her relationship with her mother and, more than that, with her older brother. Laurie said that over time her brother had become a mean man. But in her memoir Laurie could remember him as he had been before, when he was a child. She said that she had deliberately used her brother’s childhood nickname throughout the memoir for this purpose. Throughout the discussion Laurie was delightful. She was full of joy and laughter, answering questions with a shrewd wit that was entirely her own. It was a pleasure to see Laurie at the festival, and to meet her afterward and ask for her to sign my book. Here’s a token for you my dear Quill friends …. Now, I wasn’t allowed to take photos at the festival but there was a photographer there. All his photos have been added to the festival website and you can check them out here. Just scroll down until you see the photo album. You can scroll through the pictures by selecting the left and right arrows. There are some good ones there so be sure to check them out! Well that’s all for me … I hope to see you at the festival next year!